In the year 1944, Purcell Nathaniel Brown was born to Ralph and Elietha Brown. One month later he was taken to the tabernacle and was blessed by Bishop Howard L. Chase. From his early years Bro. Purcell Brown was a very active member in the church. He never allowed anything or anyone to hinder him from attending his services. Even as a teenager, he made it his duty to be in attendance at all times. He was given the office of an usher during his teenage years and he worked faithfully in this office. Because of his consistency and dependability, his pastor, Bishop W. C. Hamilton elevated him to the office of a Father Abraham. He was faithful to this calling and was always in attendance. This was evident, in that one second-day eve, it rained so much that only Bishop Hamilton and Bro. Purcell Brown shown up for service; Bishop Hamilton said he came because he knew Purcell would be there, so they both kept the service. In his early twenties, Bro. Brown was called to be an Elder and was ordained three years later in 1969. That same year, Elder Brown migrated to New York, USA and got married to St. Naomi Mercurius on Sivan 14th, 1970. The union produced one son, Richard Brown. Elder Purcell Brown attended services in Brooklyn, New York and Newark New Jersey; and Pastored in New Jersey. He being a dynamic preacher would expound the gospel of Christ in the USA; drawing souls to the Kingdom. He also visited England and South Africa where he rightly divide the word of truth to the many hearers. While in the USA, he remained dutiful and formed a Minister’s alliance which brought Ministers together for a common understanding of the scriptures. 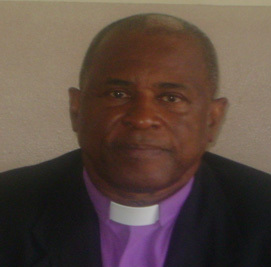 Notwithstanding, Evangelist Brown maintained his communication with Bishop Hamilton and would often attend Passover and other services in Jamaica. At the 1976 Passover in Jamaica, Elder Brown was elevated to an Evangelist by Bishop Hamilton. In 1990 Evangelist Brown came to Jamaica to attend his sister’s 25th wedding anniversary. Evangelist Brown visited the home of Bishop W. C. Hamilton. Bishop Hamilton was overjoyed to know that Evangelist Brown was in Jamaica. It was his prayers answered as he was sitting with his wife contemplating the future of the church. His wife, the late Sister Evangelist Hamilton told Evangelist Brown that Bishop Hamilton wanted to call him, but was hesitant about asking him to leave America to come and take over the church in Jamaica. As providence would allow, Bishop Hamilton asked Evangelist Brown to carry on in his stead. Evangelist Brown told Bishop Hamilton that he did not want to say “yes” but was afraid to say “no”. On the Sabbath of June (Sivan) 30th 1990, Bishop Hamilton declared to the congregation in Kingston that in his absence Evangelist Brown will be in charge. Evang. Brown on his way back to the USA on July 3rd 1990 went to visit Bishop Hamilton to bid him farewell but upon his arrival he learned that Bishop Hamilton had passed so he extended his stay until after the funeral. During this wait the late Evangelist-at-large Milton I. Lewis (then Chairman of the Presbytery Board) laid hands on him and elevated Evang. Brown to an Evangelist-at-large. Evangelist-at-large Brown was later consecrated a Bishop by the Presbytery Board of Jamaica in 1993. Democracy and the maxim, “no lazy bee in the hive” characterized Bishop Brown’s early years of tenure. Brothers were appointed to the ministry, Chairpersons and Committees fully appointed. Other appointments: - Island Exhorter, Sister Elder, District Chorister, and more singers called to sing around the throne of David. New fields were opened up in Montego Bay St. James, Porus and Comfort Hall Manchester. The establishing and upgrading of the headquarter tabernacle and the sister tabernacles such as Comfort Hall and Porus Manchester, Colgate St. Ann and St. Mary. The acquisition of 10 Lockett Avenue on which the Church hall was erected and dedicated to the late Bishop H. L. Chase. The revival of the Feast of weeks/ Pentecost and the Fourth First Services which were not previously held in Jamaica. The Church continued to improve until it experienced another division in 1998. Bishop Brown went through persecutions as many others before him: He was taken before the magistrates and resented by some, but having obtained help of God he continues unto this day witnessing to both small and great and saying none other things than that which Moses and the Prophets said should come to pass. The church continues steadfastly in the teachings and doctrine brought to us by the Prophet of God. The root is strong, the rock is firm and the gates of hell shall not prevail against it.